Mentions Larson as producer and does not mention Singer at all… hmmmm. yeah, but I think we need to focus on the aspect of what they are calling a complete "reboot." Yikes!!! Reboot. Not remake. Big difference. Hope this time it will happen! But will it be "developed" and "updated", and all the ususal mong which means it's nothing like the original? All the producer-speak daggit drivel? My guess is that it's going to be a mix of both Galactica shows. Maybe going back to non-Earth centric things such as names, clothing, etc. but, adding a rougher edge to the story. Also, I predict that there will be NO Hector and Vector!! Since Hector and Vector were written just for those 2 actors: I think you are right. We won't be suffering through that again. Reimagine could go too many ways to even speculate, only a narrow band of them good, IMHO. To have Larson named as producer instead of fighting to be legally and fiscally involved could be a better sign than the mess that began in 2002/2003. I predict some ugly "discussions" in our future. Time has passed on the original. IF this is true and they finally decide to do this I would imagine it will be a redo. I cannot see them following the original concepts. But I've been wrong before. I can handle a redo but what I cannot see again is a total tear down and changing the concept once again. But Hollywood loves to do that. If Larson is truly involved there could be some sorta hope. I also have my reservations that if they do not change major components this would fail in a theater setting. If your going to do this it should be on tv because you limit yourself so much in trying to produce a 2 hour + movie. Just another mistake by Universal. Gotta go with Don on this one. GINO did its reboot to moderate success. For all the hype, its ratings graph was a near clone of the original series ratings graph, -- a big downhill slope. Blood and Chrome apparently didn't generate enough interest to warrant any more GINO spin-offs. (That's a shame as that production really wasn't a bad effort). Caprica also failed to fire up the franchise, although I'll leave that to others as I only saw the pilot (which I also liked). This movie announcement is a bit odd. Its a reboot of a reboot. 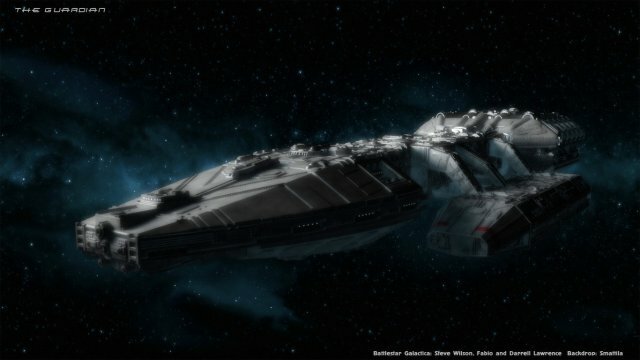 If Galactica was a self-contained story that could be told and wrapped up in 2-3 hours then Galactica 3.0 might make sense as its Ron's reimagining has now hit the 10 year mark and that is the going rate for film remakes these days. However, I don't think Galactica could ever be condensed that much without making the story incoherent. It seems there is a big missing element somewhere. I respect French maids for their minds. The Star Trek franchise was rebooted under the direction of Abrams in a very successful way, using the original characters (albeit prior to the original series and suggesting an alternate timeline) and very identifiable visuals such as the costumes, ships, and even actors that bore more than a passing resemblance to the original actors. Even an original actor was used in a "cameo" role (Nimoy). I am very much looking forward to this; best BG news I've had in 16+ years…..
Where did you get Abrams being associated? the star trek reboot wasn't bad because it took place in an alternate time line and leonard nimoy [spock] shows up. i just wish the shat could show up. his words to the younger version of himself might be. " don't go on the enterprise B and if you do definitely don't go to veridian III." There is no producer currently attached to this thing. The one guy that needs to be is in limbo as far as I have heard but IF again he is included there is a chance. Glen has some CRAZY CRAZY ideas and has never let go of the Pegasus storyline. Sorry, my bad. Just rambling, I guess. Please ignore post. i wonder if we will see walking vipers this time. star wars is managing to get a continuation of where jedi left off. i believe they are going to shoot all three films at one time like they did with the lord of the rings trilogy. Probably not, but you know, whatever we get will be better than the 2003 reimagination and GINO series…. You hope. It may make the 2003 version look great by comparison. If it gets made at all. This whole thing does echo of the last 25+ years (the last 11 of which I've been listening to), so I'm not going to be holding my breath. This is all VERY interesting news. I have to agree with Dawg on this one. I too have heard so many different stories on how BSG was going to be "continued", "remade", "reimaged", "reboot". I too am not going to hold my breath on this one (not only that but I do not look good in BLUE. I am too tall to be a smurf and too short to be a Navi. I am 6' 6" by the way). I will believe it when I see it. I would think that having your entire civilization annihilated by the Cylons, and then chased across the universe in a running battle was pretty "dark" already. Not exactly sunshine and buttercups. In my eyes they have a huge chance to fix the mess that was made in the first place. But this is Universal and they have a very serious negative track record to date. As much as I want to believe I have to agree with Sandy...could be worse than 2003. I have always said if they cannot do it right do not do it at all! I disagree. I want them to make it, good or bad. If it's bad, then once and for all maybe they'll let BSG rest in peace, and we won't have to deal with the headache of "Will they or won't they" anymore. If it's good, then great. Maybe more good will follow. But it needs to be put to rest one way or the other. No more teasing.